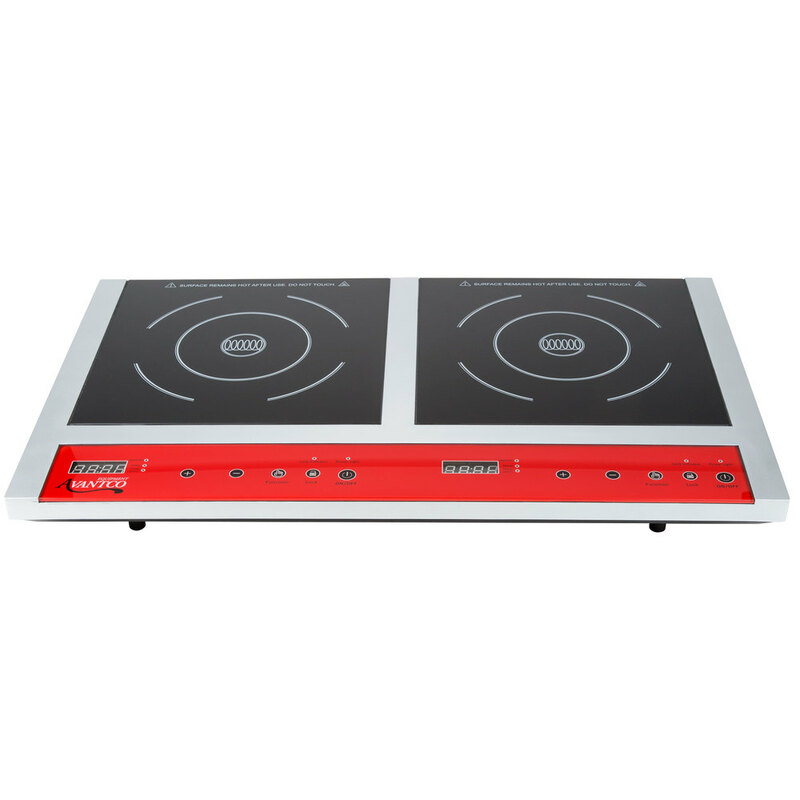 Cook your customers' favorite dishes quickly with this Avantco IC18DB double countertop induction range/cooker. This unit features dual hobs that operate independently of each other, allowing you to cook two different dishes at once. The left hob operates at 300W to 1000W and the right hob operates at 300W to 800W. 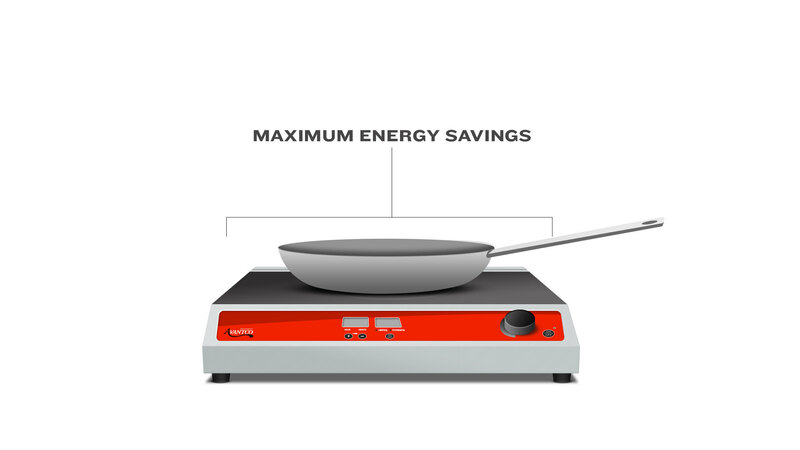 The total 1800W of power cooks food evenly at temperatures ranging from 140 degrees Fahrenheit to 460 degrees Fahrenheit, in 30 degree adjustable increments. The built-in timer can be set between 5 and 180 minutes in 5 minute increments. With only three functions, the controls are extremely simple for any employee to use. Just pick your wattage and cooking temperature, then set the timer and you are ready to cook! This unit features a 60 second cool down fan and a lock button to prevent accidental cooking temperature and cooking time changes. Simply hold the "Lock" button for 3 seconds to initiate. To cut down on kitchen mistakes and ensure your food is cooking properly, the Avantco IC18DB will beep when a non-induction pan is put on the hob. This also means that the unit will beep when the pan is removed, so the induction-ready pan should remain in place during operation. This unit is compatible with pans 4 3/4" to 10 1/4" bottom diameter. This unit requires a 120V electrical connection. What can I say? We use this everyday and it did a great job. It takes longer to cook then traditional cooker but it's okay. I have a few of these because I love the dual option so much. We use them for catering and I have one at home for hot pot! We are happy with this Avantco double counter top range/ cooker, it works well and looks nice, and is a good price for our needs. Once we figured out how to use this... It works wonderful. It is a perfect size for small spaces. I like that it has dual controls so each side can have a different setting. I would highly recommend and would even purchase again if needed. 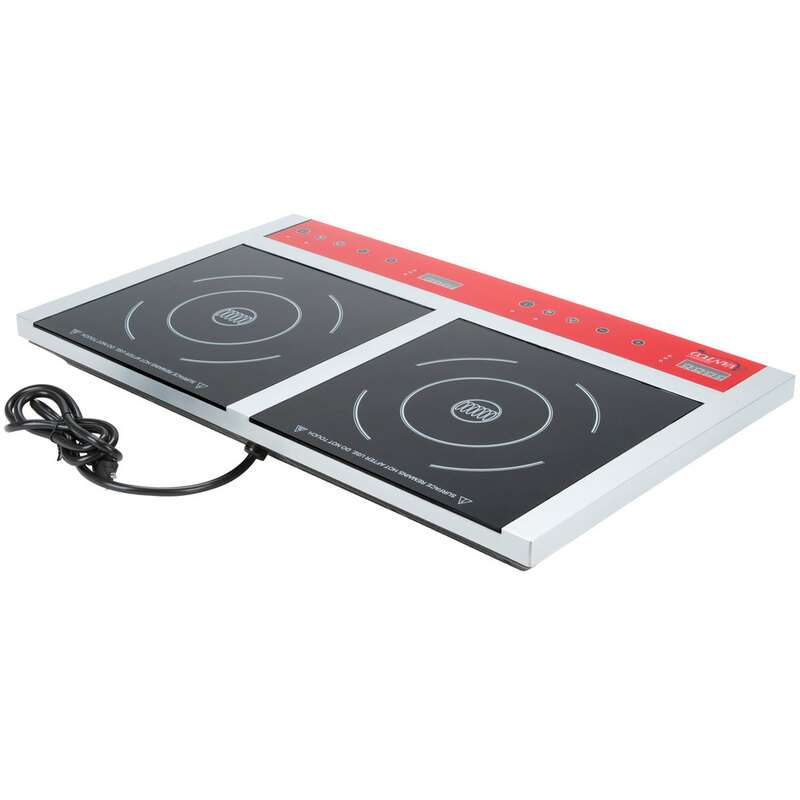 Wasn't sure about a induction cooktop but going to try it. I do not regret it. When you remove your pot or spilt from the eye it will automatically go off. Which is great when you are busy.. The only drawback is that parts of the non induction area will melt if the pan touches it. Other than that I am able to sear fritters on the 1000 watt range and fry eggs on the other range. Excellent product. This is a great option for a low price entry to induction, or if you are using it to heat things up only. Doesn't quite have the power that a single burner has but for the price and design it works well. this is a decent product. It heats well and looks pretty slick. The one downside for us was we tried to is a pot that was a bit larger than the cook top and it melted some of the red plastic. completely our fault, but i may have purchased a different using if i knew this . Awesome product. Great for saving space and fits in our kitchen perfectly. This product does its job helping to cook and heat anything that we need. 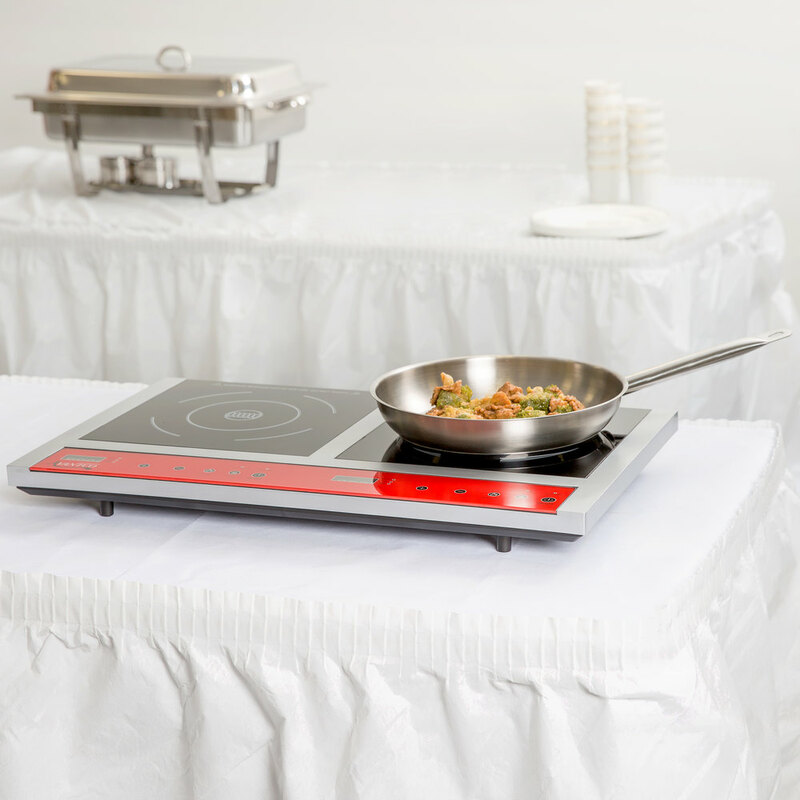 The Avantco induction range is functional, but could use improvement of some details that you don't notice until use. The glass tops are recessed just below the plastic around them. This causes them to catch radiant heat from the pan and start to melt during use. Controls are less than intuitive, with the default setting being in watts. I don't speak in watts. I do have a solid grasp on graduated (1-10) scales and temperature, which would be the ideal method of control. Overall the construction feels pretty cheap and the unit is very noisy. Definitely not a top of the line induction range but at least it does make pans hot and cook food.